Editor’s Note: Looking back in time, people’s personal hygiene, fashion choices, medical treatments, and more sometimes look, at the very least, bizarre, if not outright disgusting. When confronted with these weird or gross practices, our first reaction can be to dismiss our ancestors as primitive, ignorant, or just silly. Before such judgments, however, we should try to understand the reasons behind these practices and recognize that our own descendants will judge some of what we do as strange or gross. Here at George Washington’s Ferry Farm and Historic Kenmore, we’ve come to describe our efforts to understand the historically bizarre or disgusting as “Colonial Grossology.” The following is the latest installment in Lives & Legacies’ “Colonial Grossology” series. In over five years working in historic house museums, it has come up in conversations with visitors more than one might expect and far more than the 18th century Virginia gentry would have thought proper. After passing through drawing rooms, dining rooms, and bedrooms, the youngest in a tour group often realizes, with very little shyness, that “There’s no bathroom! 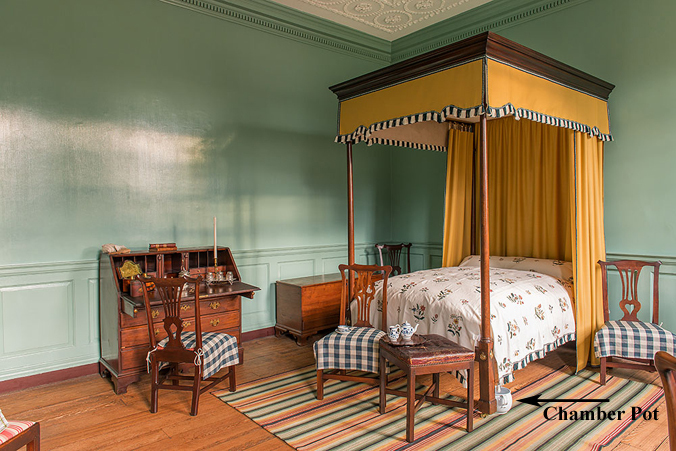 Where did they go to the bathroom?” Veteran historic house visitors will often notice a certain object on the floor near a bed and, in hopes of not being overheard by others on the tour, quietly ask if the object is what they think it is. As a museum educator, I’ve come to embrace discussing how colonial Americans did their business because those acts are fundamental to being human. Discussing them reminds us that the larger-than-life characters who lived two centuries ago were just like us. So, just how did early Americans go to the bathroom? Many visitors imagine they used an “outhouse.” It seems that few colonial Virginians, however, had outhouses or privies, as the structures where known in the 1700s. These buildings were much more common in other colonies. A privy was a small wooden structure usually built behind the house with a floor built over a good-sized hole dug into the ground. Inside the structure, a wood plank served as the seat and a round hole cut in this plank allowed the waste to fall down into the pit. Privies sometimes featured multiple holes (including smaller holes to ensure children did not fall into the pit) but, of course, little privacy. While certainly important to their early American users, privies also yield important secrets to today’s archaeologists. Seeds ingested when colonial people ate passed from the people into their privies and actually survive to be excavated hundreds of years later. These seeds tell archaeologists what kind of fruits and vegetables people were eating. Even eggs from parasites that lived inside colonial people were deposited into the privy pit when they went to the bathroom. These eggs also survive and reveal what kind of illnesses people suffered from 200 years ago. A lot of people had stomach worms! When someone living in the 1700s woke to the call of nature in the middle of the night, that person didn’t necessarily want to go outdoors and use a privy. Who wants to walk outside when it’s raining, snowing, cold, and dark, after all? Instead, you simply used a chamber pot resting next to your bed. Chamber pots came in a variety of shapes and sizes and could be made from ceramic or metal. Chamber pot tucked under the bed in The Chamber at Historic Kenmore. 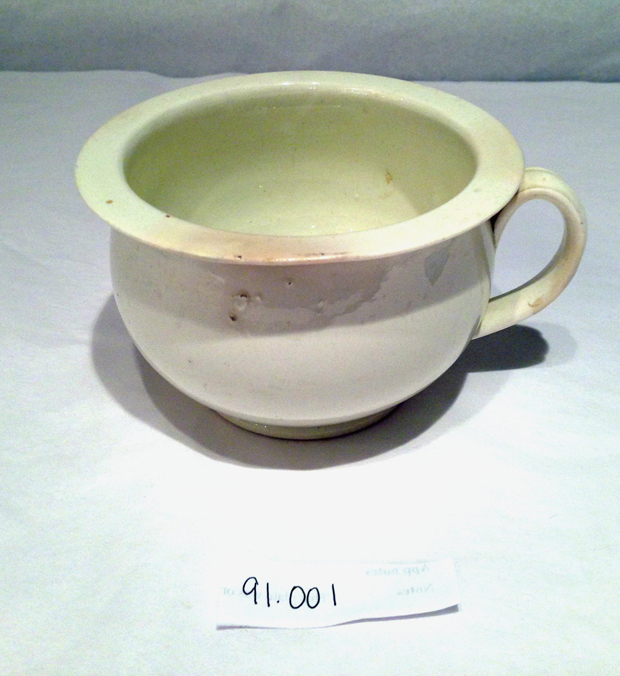 A porcelain child-sized chamber pot. It actually was quite common for the chamber pot to even be part of a special chair called a close stool, which looked like an ordinary chair but, in fact, its hinged seat lifted up to reveal a chamber pot. The collection at Kenmore contains a chair originally made in the 1700s and then modified in the early to mid-1800s into a close stool chair. The chamber pot and the close stool chair were probably enough for most colonial Americans, a good majority of whom never bothered to build a privy. No privy dating from George Washington’s time has been found at Ferry Farm, which means he and his family probably used only chamber pots and/or close stool chairs. In fact, archaeologists found fragments of a stoneware chamber pot in the Washington house cellar during excavations in 2008 and 2009. It features hand-painted cobalt blue floral design and dates from the mid-18th century. In the photos below, the pot is upside down and resting on its rim. At Kenmore, Fielding Lewis’ probate inventory lists a “close stool chair and pan” among the house’s upstairs furniture. When George or Fielding used the pot or the chair, either they themselves or, more likely, their enslaved house servants tossed the waste outside. People emptied their pots in a variety of convenient places: into a pit for just that purpose, into the nearest body of water, onto their vegetable garden as a fertilizer known as “night soil,” or just out the nearest window. What could be more convenient! On plantations and farms, waste flying out of windows wasn’t necessarily an immediate danger to other humans. People living in crowded cities and towns throughout the colonies and Europe still emptied their pots in much the same way as their rural counterparts. They just tossed the waste into the street. Some localities did have rules about disposal. In Edinburgh, for example, residents could only empty their chamber pots “after 10:00 p.m., upon the sound of a drum, and only once they had shouted a warning of ‘Gardy-loo!’ (‘Mind the water!’) to passerby.” The southern French city of Marseilles required residents to give three warnings before emptying. In nearby Avignon, however, people walking in the street at night had to make their presence known by shouting. New York City passed an ordinance in 1724 making it illegal to dump waste into the street. Residents had to walk to one of the rivers to dispose of their waste. Privies, chamber pots, close stool chairs, night soil, rampant stomach worms, and waste lying in the street. Relative to today, the 18th century was not a terribly clean or healthy time. While not a pleasant topic, the ‘gross’ bathroom tools and customs of two centuries ago can teach us much about the everyday lives of early Americans and, ultimately, their most important lesson may simply be that our ancestors were human too. A. Roger Ekirch, At Day’s Close: Night in Times Past, New York: W.W. Norton & Co., 2006, pg. 28.